Provide comfort for the family of Anne-Marie Guillaume with a meaningful gesture of sympathy. Anne Marie (Dumesle) Guillaume, 73, of Waltham, MA, passed away on Sunday, December 2, 2018. Her memorial service will be held at Kingdom Hall of Jehovah's Witnesses, 9 Beach St. Cambridge, MA on Saturday, December 8, 2018 at 3:00p.m. Visiting hours will be held prior to the service from 11:30am to 1:00pm at Brasco & Sons Memorial Chapels, 773 Moody St., Waltham, MA. Parking attendants will be on duty. Anne Marie was born in Ducis, Haiti to the late Renel and Leonnie (Dorvil) Dumesle. She worked for many years as a Kindergarten teacher in Haiti before immigrating to the United States with her family in 1999. She has been a resident of Waltham ever since. As the eldest of seven children, Anne Marie was the beacon of her family. She acted as a second mother to her younger siblings, and loved spending time with her own four sons. She was also a devoted member of Kingdom Hall of Jehovah's Witnesses in Cambridge. She loved cooking, caring for others, and watching her favorite team, the Boston Celtics. She is survived by her loving husband Joseph Milot Guillaume; her devoted sons Jerry Guillaume and his wife Kristina of Kensington, NH; Richard Guillaume and his wife Theresa of Peabody, MA; Jacques Guillaume and his wife Jessica of Lunenberg, MA; and Jeff Guillaume and his wife Karen of Wakefield, MA. She leaves behind her cherished grandchildren Alexis, Olivia, Jace, Julien, Grayson, Kadira and Aurora. She is also survived by many nieces and nephews. To send flowers in memory of Anne-Marie Guillaume (Dumesle), please visit our Heartfelt Sympathies Store. We encourage you to share your most beloved memories of Anne-Marie here, so that the family and other loved ones can always see it. You can upload cherished photographs, or share your favorite stories, and can even comment on those shared by others. 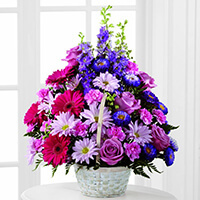 Your TD Bank Family sent flowers to the family of Anne-Marie Guillaume (Dumesle). Your TD Bank Family purchased the The FTD Pastel Peace Basket for the family of Anne-Marie Guillaume.